In seasonal environments, timing is everything: Ecosystem dynamics are controlled by how well predators can match their prey in space and time. A recently published study, led by University of Hawai'i at Mānoa oceanographer Anna Neuheimer, revealed that fish parents "predict" a beneficial environment for their offspring with populations "adjusting" spawning time so that the young can meet their prey. Survival at this early stage affects population size and shapes how many fish will be available to fisheries in later years. 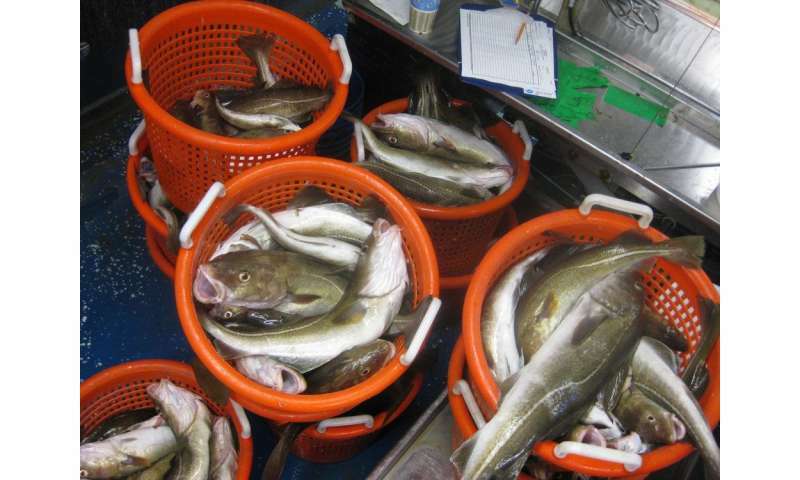 Atlantic cod, a wide-ranging and economically important fish, reproduce at different times of the year—varying 86 days across the species' range (nearly 40˚ latitude) in the north Atlantic Ocean. This pattern is unexplained by temperature variation but had been suspected of being adaptive, that is, providing some advantage to the populations. To overcome this challenge, Neuheimer, an associate professor at the UH Mānoa School of Ocean and Earth Science and Technology (SOEST) and visiting researcher at the Aarhus Institute of Advanced Studies at Aarhus University (Denmark), led co-authors in Denmark to develop new tools that combined data on the timing of observed stages, temperatures across the North Atlantic and temperature-dependent development rates to estimate timing of—and the match between—the targeted stages of young fish and their food. "This timing match is a challenge for the parents, as eggs take weeks to develop before the young fish need to feed—that is, they must "predict" when their young's food will occur weeks in advance," said Neuheimer. As the climate changes, seasonal timing is advancing 30-40 percent faster in the ocean than on land. This study, at the nexus of ecology and evolution, provides new tools that can be used to help predict fisheries catch changes in the future.